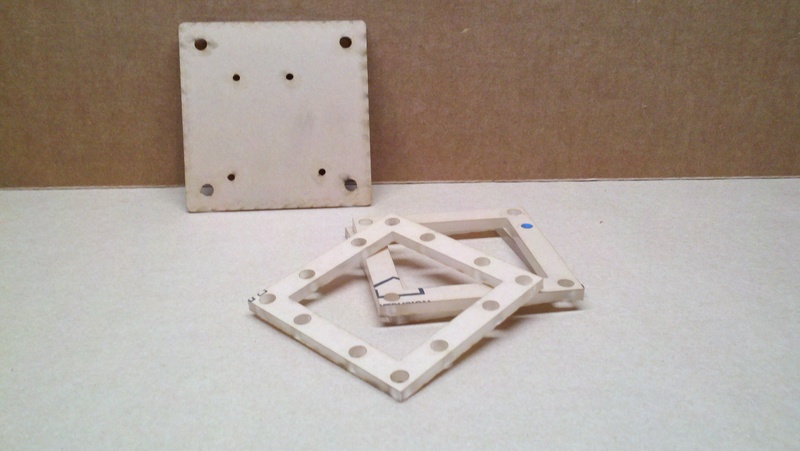 As before, this prototype was fabricated in 0.75″ MDF using a ShopBot Desktop CNC mill with a 0.25″ spiral bit (Onsrud 65-023). The design was modified from Prototype II to incorporate the targeted improvements. Two sets are being routed in this job. Each set has two base parts and cap. 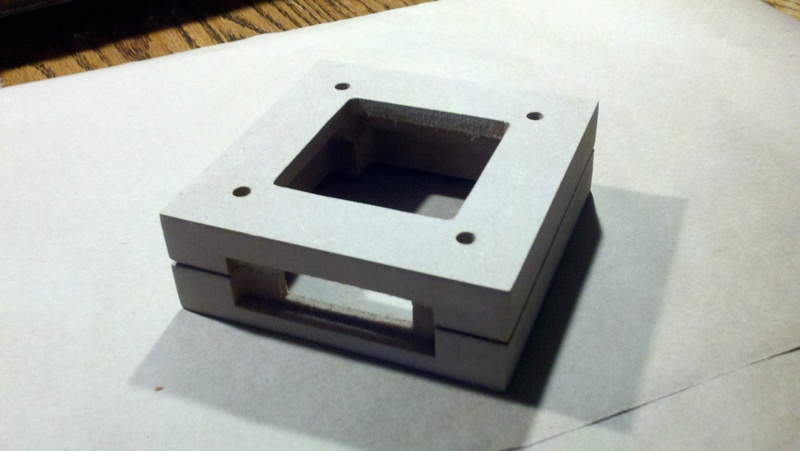 The bottom base piece is now cut all the way through and a plate is used to mount the Arduino. There needs to be a recess routed for the plate, which is on the other side of the bottom base piece. 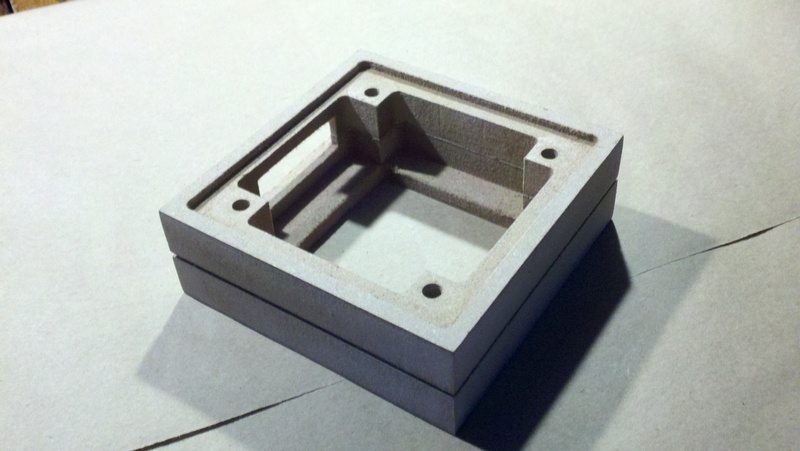 In order to align the plate recess on the bottom base piece during CNC routing, a very simple jig was made. 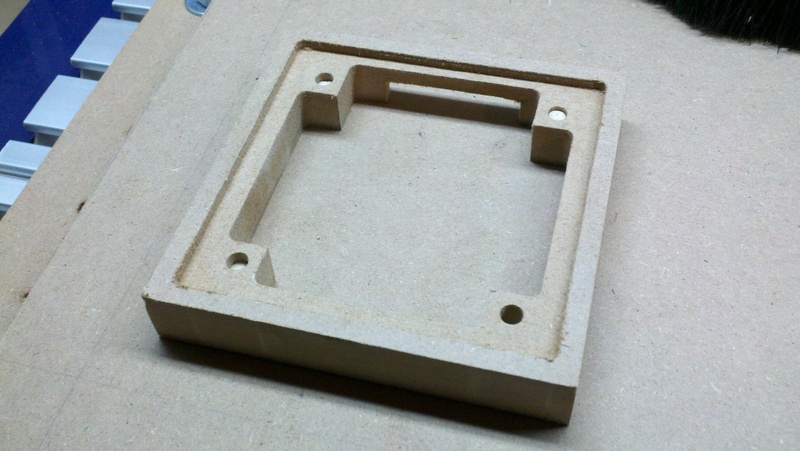 Four 0.25″ holes are routed in a piece of MDF corresponding to the base mounting holes. Pieces of 0.25″ dowel are inserted into the holes. 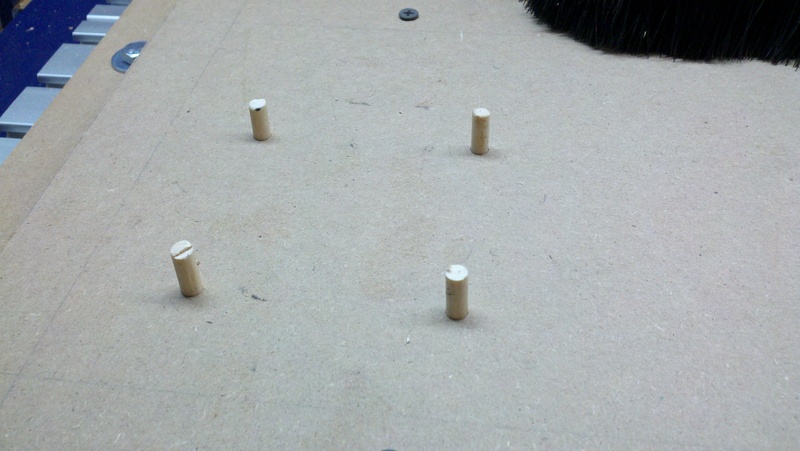 The bottom base is then mounted on the dowels and held down with tape (not shown). The plate recess is then routed after re-zeroing the height. The spacer is now replaced with a stack of translucent plastic lightguides. 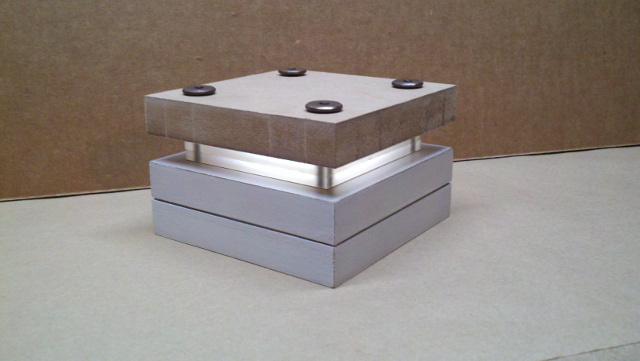 The top lightguide (0.25″ thick) has holes to accommodate 3mm LEDs, the remaining ones don’t need this hole. 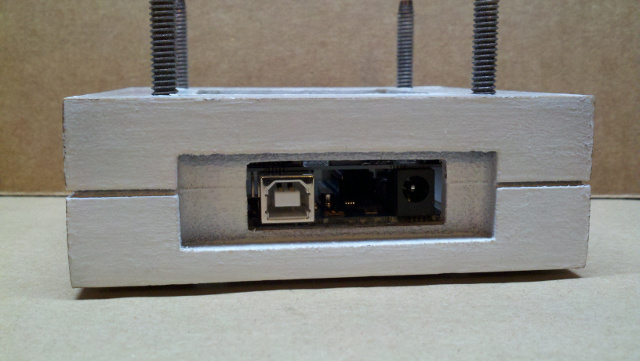 The larger piece is the Arduino mounting plate (0.125″ thick). These pieces were laser cut atMakerPlace in San Diego, CA. 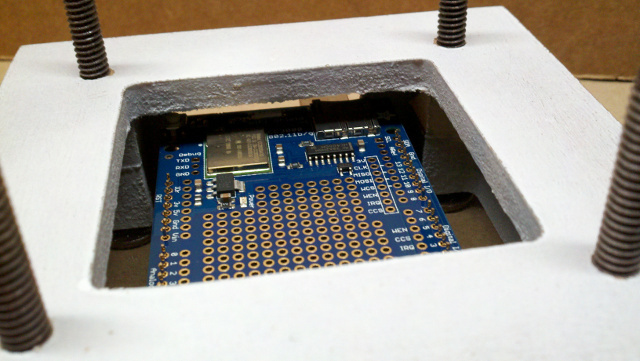 Now that a plate is being used to mount the Arduino, the base pieces no longer form a clamshell. This allows glue the two base pieces together for easier assembly. 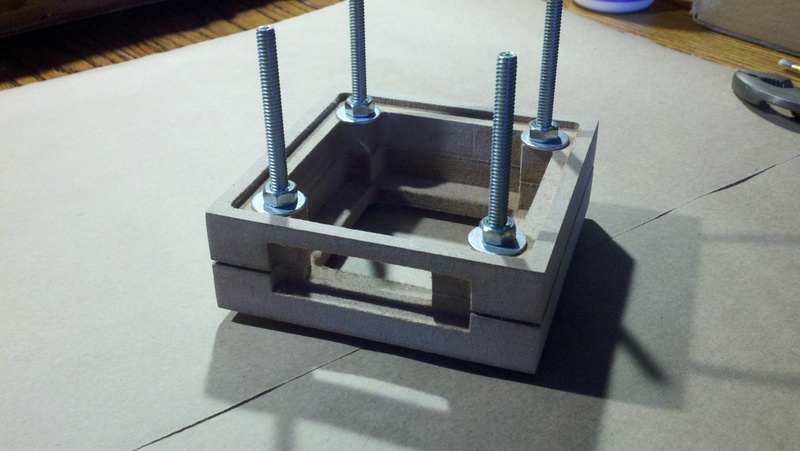 The two pieces were glued together and clamped with 1/4-20 bolts. Bottom View: Here is the resulting combined base pieces- much easier to handle. Top View of combined base pieces. 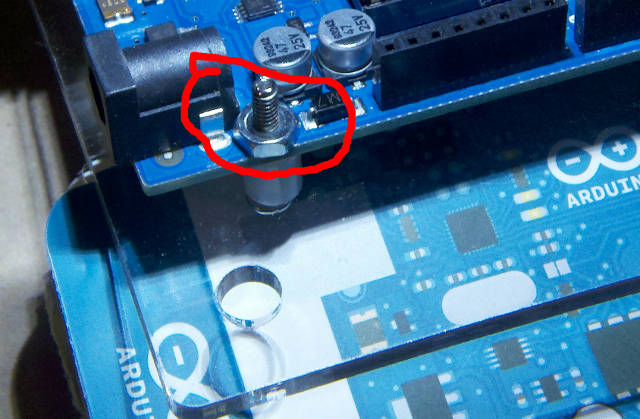 The holes in the mounting plate fit the Arduino well, however a metal nut should not be used on the board due to electrical shorting risks. This needs improvement. The clearance for the electrical stack (Arduino + WiFi shield) is excellent. The alignment of the connectors to the opening is good as well. 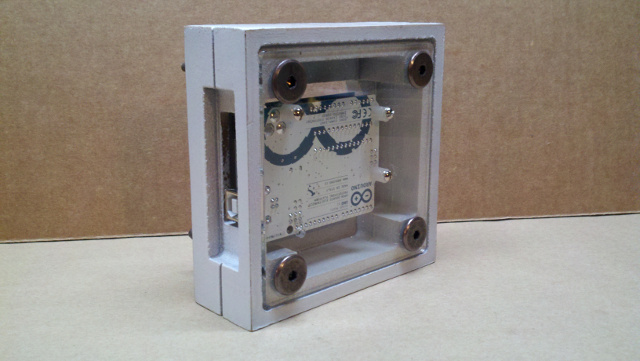 The asymmetry in the opening arises from the Arduino layout. The next iteration will consider a symmetric opening. Here is a view from the bottom (‘Revealed Mechanism’). The lightguides were stacked in the test assembly (but their protection paper was not yet removed). An LED puck was placed inside the assembly to get a sense of what the lighting might look like- more pleasing than the previous prototype. The screws can be seen in the translucent acrylic giving a subtler instance of a ‘Revealed Mechanism’. Need to see how it looks with the actual LEDs. 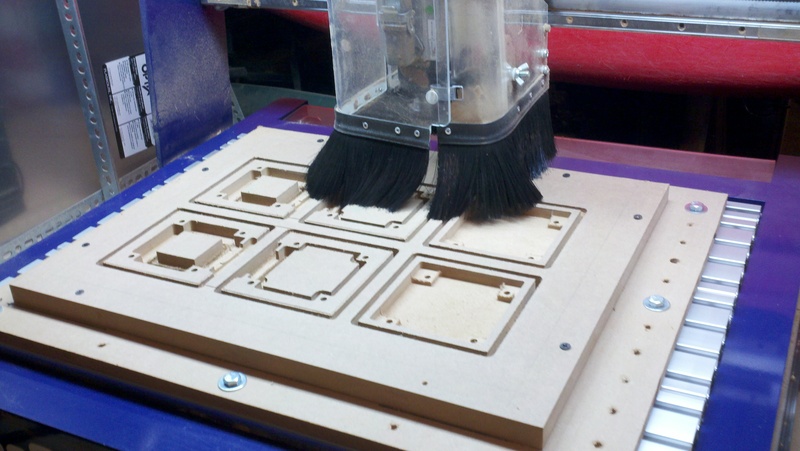 It also offers a customization method since laser cutting is generally simpler than CNC routing. The upper shield holding the LEDs still needs to be designed and tested. The mount needs to avoid potential electrical shorting and still be secure.